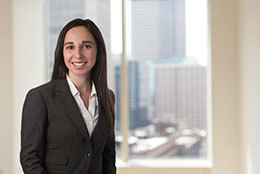 Carmel Arikat is an antitrust associate in Axinn’s Washington, DC office. Her practice focuses on representing clients before the U.S. Department of Justice and the Federal Trade Commission in merger reviews, antitrust litigation and government investigations. Also experienced in complex commercial litigations and arbitrations, Carmel has represented clients in a variety of industries, including financial institutions, telecommunications companies, a defense services company and an industrial gases company. Prior to joining Axinn, Carmel practiced in the litigation department of a global law firm. She earned her JD at Harvard Law School, where she was Senior Technical Editor of Harvard Law and Policy Review, served as a research assistant to Professors Charles Ogletree and James Greiner, and worked at a predatory lending prevention and consumer protection clinic. She holds an undergraduate degree in Government from Georgetown University.